I scare easily–always have. Paul, on the other hand, is a bit of a daredevil. And when we were on vacation a couple weeks ago, he took one of his bigger risks. We were in Barcelona for La Merce, a multi-day festival. 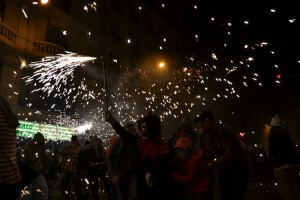 One of the main events is called Correfoc. After the initial 10-year-old fun of saying this (those last three letters are pronounced similarly to a choice four-letter word in English), we learned what it translates to: fire run. And then we learned what it involves: people dressed as devils holding what amount to be sparklers on steroids, plus vehicles equipped with what I can only describe as cannons that spew sparks. I thought I was safer in my far-away spot. Then, sparks landed on the head of a woman near me with dry, color-treated hair; her tresses spontaneously combusted. Her pals quickly suffocated the flames, as they all cracked up about their friend’s hair being ablaze. This caused me to retreat farther away from the wild sparklers, against a wall of a restaurant with more scaredy-cats like myself (mostly women in their 40s and 50s, so I fit right in). The whole time, I was worried about Paul. What kind of charred state would he return in? Why did he need to put himself in danger? Would he continue to crave danger when he became a father? Once the parade died down, our friends and I met up to head to our late dinner, par for the course in Barcelona. Thankfully, despite being pummeled with sparks, Paul didn’t emerge from the parade in a crispy condition, though the fire did burn the camera lens on his cell phone. Paul insisted he was never in any real peril, but I still would prefer he doesn’t get in that position ever again. It’s no fun fretting about the safety of someone you love. Who’s the bigger risk-taker in your relationship? How would you feel if your spouse flocked to fire like Paul does? Do you think daredevil types should play it safer once they’re parents?